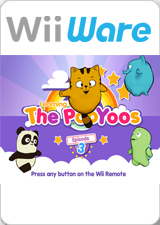 Learning with The PooYoos: Episode 3: welcome to the world of the PooYoos, the first fun poetic braintrainer for children 3-6 years old. With the PooYoos, a merry band of adorable baby animals, children will have fun while learning the basics for his or her development: numbers, letters, lateralization, shapes, colors and more. Children get to dance with their new friends and are offered lovely interactive rewards. With two levels of interactivity, all children whatever their age and level can play the activities based on plants and music. This game has been designed for use by children who have not yet grasped reading. The instructions are spoken in French, English, or Spanish, depending on the language setting of the Wii console. The graph below charts the compatibility with Learning with The PooYoos: Episode 3 since Dolphin's 2.0 release, listing revisions only where a compatibility change occurred. This page was last edited on 19 January 2018, at 00:58.